From birth to age 2, your child will display traits that seem simple on the surface yet, for some reason, amaze you and fill you with a sense of pride. This is normal. Otherwise, the field of developmental psychology wouldn’t be so interested in understanding how these mental and behavioral changes take place. Though the brain governs the lion’s share of your child’s social skill growth, you should remember that how you interact with him also plays a large part in how quickly he develops. 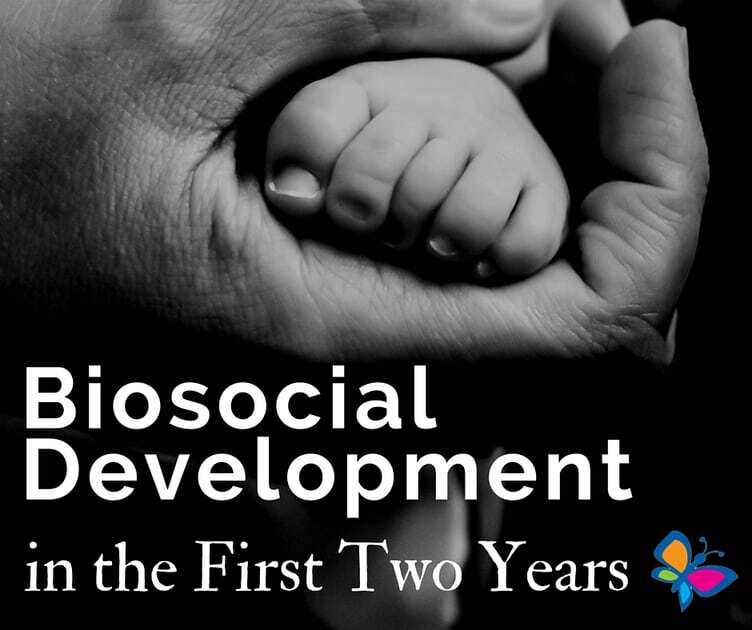 Though biosocial development in the first two years of life tends to be “under the hood,” some of the most important biosocial development is reflected in a child’s changing behaviors during this important developmental phase. One of the most obvious types of biosocial development is that of the mental creation of an attachment type, which describes how a child defines her relationship between her and her parents. Psychologists tend categorize attachment into four types: secure, anxious, avoidant, and disorganized. A parent has much control over his child’s attachment type, dependent on how he interacts with his child. For example, a child showered with too much attention and concern might become “anxious,” feeling uneasy when his parent is not immediately present. Parents of teenagers would much rather their children be formally socializing or studying than playing, but for children under the age of two, playing is the fastest path to gaining the social skills needed in the future. By the age of one, children have the cognitive capacity to engage in pretend play, in which they imitate adults doing adult things, such as putting on making or going shopping. Through pretending, children practice for adulthood and engage their imagination, creating a cycle of biological and social development. Society couldn’t exist without communication. While rudimentary, your not-yet-two-year-old’s language abilities are in a phase of rapid growth. Due to the rapid development of your child’s brain, his language abilities quickly extend from the ability to recognize the phonetic sounds of his mother language to being able to internalize the basic grammatical rules of the language. Other than the language itself, the rate at which he learns the language also depends on what he hears from his parents. The more you expose your child to a variety of sounds, words, and structures, the more quickly he’ll master this important social tool. A large part of the abilities we take for granted is just the brain’s pattern recognition abilities. Pattern recognition, or the ability to fit phenomena into categories, begins at around the time a child is one year old. At this time, children can match similar objects. Gradually, she learns to group objects into simple categories, such as animals or colors. As much of society is group-based and defines different conventions for different groups, this skill is crucial in biosocial development. One of the first examples of this is a child’s ability to separate adults from other children.